RLIMS-P is a rule-based text-mining program specifically designed to extract protein phosphorylation information on protein kinase, substrate and phosphorylation sites from biomedical literature (Torii et al., 2015). RLIMS-P currently works on PubMed abstracts and open access full text articles. We are currently working on enhancing the backend database for RLIMS-P. As a result RLIMS-P database is not being updated on a regular basis. Please bear with us. Or Enter PubMed IDs (PMIDs) delimited by "," or space, e.g., 15234272, 16436437. This RLIMSP website enables user search phosphorylation information by keywords or a list of PMIDs in the database. 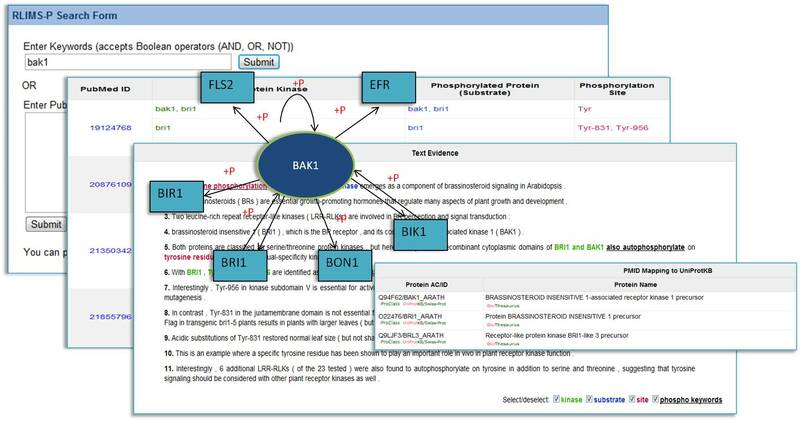 The results (kinase, substrate, site) are displayed in sortable tables with text evidence and downloadable for further research.